The Digiflow FlowX3 line includes a complete range of paddle wheel flow sensors, instruments and sensor installation fittings. 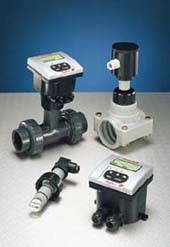 Also included are insertion type electromagnetic flow transmitters. FlowX3 products provide high quality and state-of-the-art technology. All products are manufactured under ISO 9001:2000 and conform to the highest CE standards. Marsh backs the FlowX3 line with service and support. The frequency output is linearly proportional to flow rate from 0.15 to 8 m/s (0.5 to 25 ft./sec.). Approximately 45 Hz/m/s. 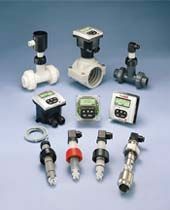 Sensor installation fittings are available in a large selection of types, materials and pipe sizes up to 24" and larger.